I did go to Mandarin today and gorged myself on dumplings, and 1,000 yr old egg. That was served in a Chinese soup spoon and seemed to be mostly tofu to me! 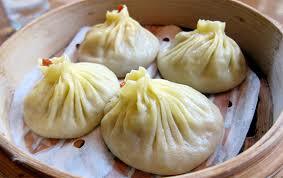 But boy were there some good dumplings. I also tried spicy chocolate ice cream which was about as spicy as milk, but it was good chocolate ice cream. I bought Matt some egg rolls and chicken balls to have for supper. The restaurant have said he can have a rain cheque and book when he is OK again. I think there were more dumplings this year than I ever remember in previous years. I also had some of my favourite kelp salad and of course I started with Hot and Sour Soup. 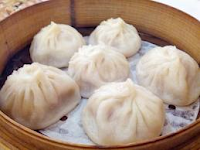 I am not sure when the New Years Dumpling festival ends, but I will have to make sure I go back before the end. These pix are only 3 of the many they had on offer today. Tomorrow, Wednesday, I go to exercise classes. I bumped into another English woman who lives in the building, I have known her casually for a while. I didn't really know she lost her husband a year ago. She was sitting in the lobby and said she did so for a change of scene. She was obviously lonely. I suggested she come to classes with me and I am pleased to say she has agreed to come tomorrow. I think she will enjoy it even if she can't do a lot. Many can't at the beginning and end up doing a lot more than they expect, after a while. Not only that there is the camaraderie of the women who participate. We have quite a bit of fun as well as doing ourselves some good. Maybe I should email our instructor and warn him there is another Limey coming to class. I think I might go bowling after class and I think Matt might come with me!! Not to bowl but just to accompany me. I checked with the alley about my status after missing Monday. I had bowl aheads in the system so apparently only dropped one point on my average. Unfortunately that means there are two of us at the same average. Gotta do something about that. However, I learned my team took 7 out of 9 points which is good. After being at the Mandarin, I went shopping and tried to be more controlled and shop thinking of what we needed and not what I/we wanted. I did pretty well. Spent less than I expected. I heard this advice on TV a week ago - a woman was saving a lot on groceries by buying what she needed and not what she wanted. I fell by the wayside buying myself a couple of artichokes, I do enjoy them and they are not always available. I didn't buy one thing I needed and then realised I had enough points I wouldn't have to pay for it anyway. Duuh. I used to love salad sandwiches but mine were not as ornate as this one. Sounds pretty good though. Think of this as a salad sandwiched between two slices of bread. 1. Place chives, mayonnaise, tarragon, and yogurt in a blender. Add zest and juice of 1 lemon half, then add 2 Tbsp. oil; season with salt and pepper. Purée until smooth. 2. Squeeze juice from remaining lemon half over lettuce and cucumbers in a medium bowl. Drizzle with oil; season with salt and pepper. Toss to coat. 3. Divide and smash avocado between 2 slices of bread; season with salt and pepper. Arrange lettuce and cucumbers over. Top with mozzarella and sprouts. 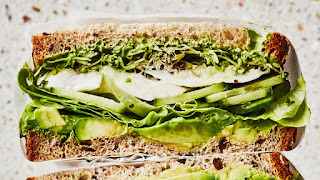 Spread remaining 2 slices of bread with ¼ cup green goddess dressing and close sandwiches. I am teed off (to be polite) it was snowing today and Matt started getting all screwed up about my driving to the bowling alley because they forecast that it would be bad by the end of the day. In the end I capitulated because I didn't want him sitting here worrying. So, I didn't bowl which, because my bowl aheads are not good, our team probably went down the hole. My lead in the ladies average probably went for a tumble anyway. As it happens, I could have driven there quite happily. It did snow constantly all day but the roads were fine until traffic stopped running constantly when the roads started to turn white. Tomorrow we are supposed to go to Mandarin for Matt's birthday lunch, I am not too sure about driving conditions by lunchtime tomorrow. We shall see. Always assuming Matt agrees to go. His foot is hurting him just above the toes and he is convinced that is where he broke a bone. It isn't. I spent a while this afternoon trying to solve the mystery of my floating cursor without much luck. Our exercise instructor suggested I should try out different USB ports. Doesn't make any difference. It is obviously the lap top as I tried it's mouse on my desktop and it worked fine. Tried the desktop mouse on my laptop and all was haywire. Maybe throwing my laptop over the balcony might help. Me if not the laptop. I had some mushrooms I wanted to use up so searched for something to do that was different. I came across this little recipe which was quite simple and delicious. I grow basil so that helped. I only had half a pound of mushrooms but it worked very well. 1. In a skillet melt 2 tbsp Butter. 2. Add garlic, allow to brown, then add mushrooms, basil, Salt and Pepper. 3. Cook until the mushrooms are just tender. 4. Add remaining butter and olive oil. 5. Stir and remove from heat. 6. When Pasta is cooked reheat the sauce add parsley. 7. Mix with Pasta and enjoy. Friday evening I completely forgot about doing a post for Saturday. Not sure if it's tiredness or just senility LOL. I did cook the Slow Roasted Salmon in Parchment Paper which turned out pretty well, we both enjoyed it. Saturday was a Hot and Sour Pork recipe from Closet Kitchen. It was good too. Although I found flouring the pork with egg and cornstarch was a bit harassing to say the least. I decided to do a Chinese recipe for cabbage with it, which wasn't so good, it tasted fine, it just was too uncooked. Completely raw would have been edible but part cooked made it as tough as old boots. I decided the cabbage at least wanted steaming. I just read that Cape Town in South Africa is expecting to run out of water in the not too distant future. They have apparently been having a water crisis since 2015 but now it is becoming super serious. This is a warning of things to come; every nature documentary I see these days talks about the lack of snow in the mountains together with shrinking glaciers which means our water sources are getting lower and lower. Damning is also causing lots of problems on many rivers and large lakes are shrinking to nothing. Until recently the Colorado River no longer reached the sea. I believe that has been changed and now some water gets through. Sorry, unbelievers, but global warming does exist and the effects are beginning to be felt everywhere. I have no particular wish to die you understand, but I often experience a feeling of relief that I am not going to be here when a lot of our human made problems come to a head. The marijuana lab called me with an appointment on Wednesday so we will see what happens there. However, I am now being given to understand that it is quite expensive to go onto medical marijuana and I don't know if our insurance will cover the cost. If not, I guess that's the end of it for me. Naive of me but I thought the government would include it on the drugs they help pay for. I also hope our insurance will do so instead. Life is being very frustrating for me lately, my printer keeps only printing half of a document and then apparently seizing up and the mouse on my laptop causes the cursor to wander where and when it will. It appears both problems have been experienced by many but I cannot seem to find a reliable cure. Reading my very first blog this weekend, I see I included a recipe. I didn't realise that I would be posting so many recipes, I had no clear idea what I wanted to write about when I started. I also just made my half year Blog Book and looking at one of the recipes I published was horrified at the typos. I tend just to copy a recipe and rarely think to check them. Maybe I should, I realise I make typos anyway, (caught a few here before I published) but this recipe was full of them. This is, once again, a recipe I got from Closet Cooking. I really don't know how Kevin Lynch has time to cook and photograph as much as he does, but those recipes I have tried have always been excellent. He describes this one as quick and easy, maybe if you choose optional for the cornstarch, I didn't, and found it a bit of a pain, however, it was actually well worth it. 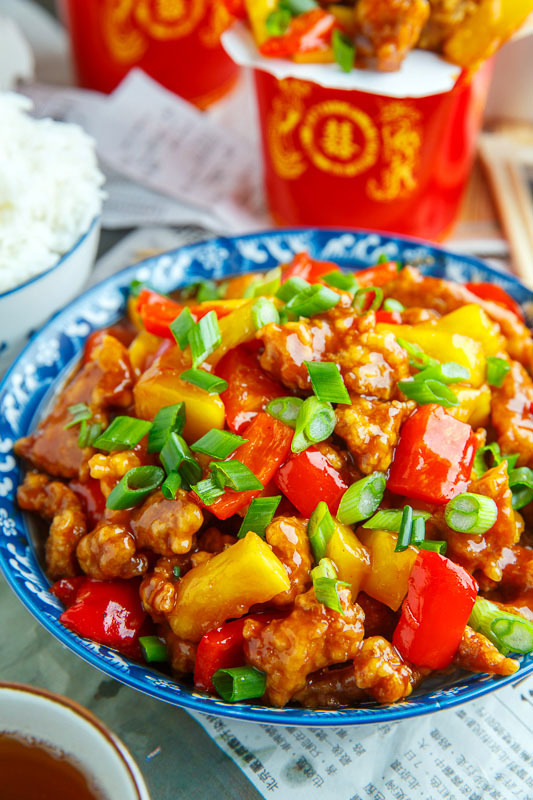 A quick and easy homemade sweet and sour pork that is so much better than takeout! 2. Add the red pepper and pineapple and cook until just tender but still crisp, about 2 minutes. 3. Add the mixture of the honey, vinegar, ketchup, chilli sauce, pineapple juice, garlic, ginger, the mixture of the water and the corn starch along with the pork, toss to coat and cook until the sauce thickens, about a minute. 4. Remove from heat, mix in the sesame oil and serve garnished with sliced green onions. 5. Option: Replace the pork with chicken. 6. Option: Use vegetables your favourite vegetables. Sorry no Thursday blog, but having been awake for such a long time on Wed. morning worrying about the surgeon and Matt's foot, I ended up going to bed VERY early. Although funnily enough I am still tired. I finally heard from the surgeon's office. We were told Matt could wean his foot out of his air cast (he hadn't been wearing it for 2 1/2 days) as he had told us. He most certainly didn't tell us anything of the sort. His instructions were to start wearing shoes and Matt could do anything he liked, such as bowling. Anyway, the physiotherapist was here today and she agrees with us that as Matt has not been suffering much pain from his ankle, if any, he can leave the boot off, unless he starts feeling a lot of pain. She got him doing his exercises including a new one and I think she has got through to him how important they are. I hope anyway. I got him to do them all again later in the day. Long may it last. We both went to the bowling alley on Wednesday afternoon and Matt tried a couple of balls but felt his balance was off so he stopped. As an aside to Helen Venn who is also wearing a boot, Matt's fracture was not a very major one which is probably why it has healed so well, so quickly. bowled a 125 and a 179 today. Quite a difference. Matt has always had trouble with electronics of any kind and having left him a few times knowing he probably couldn't remember how to call my cell phone, I decided to buy a phone he could use. Actually I thought it was a good idea, I can put pix of me (cell phone) and his daughters on there and maybe a local friend. Been having trouble with my Tablet lately too and now it seems to not be taking a charge any more. Looking at one at Walmart which would do me. Still gonna cost me $100 bucks though. Holding off for the moment. I had a recipe all lined up and then I came across this tonight and thought it sounded delicious. Maybe not for breakfast but lunch or even supper. I would certainly eat it for breakfast but not sure I could be bothered to make it at that time of day. for 10 minutes, then fish them out of the water and turn off the heat. Let the potatoes cool a bit, then move them to a cutting board. Slice the potatoes very thinly (think less than ¼-inch). 2. Heat a large skillet with plenty of olive oil over medium high heat. Fry the potato slices until golden brown, about 2 minutes per side. Depending on how large your pan is, you may need to fry the potatoes in shifts. When the potatoes are golden brown, turn them out onto a plate lined with paper towels. Wipe out the skillet and set aside. 3. In a large bowl, beat 6 eggs with ½ cup water, ¼ cup grated Parmesan cheese, and 2 tablespoons jarred horseradish. Season the mixture with ½ teaspoon kosher salt and black pepper. Drop the fried potato slices into the egg mixture and stir until fully incorporated. 4. Heat 2 tablespoons more olive oil in the skillet over medium, then pour in the egg and potato mixture. Let the mixture cook for at least 5 minutes before checking underneath to make sure it’s cooking. 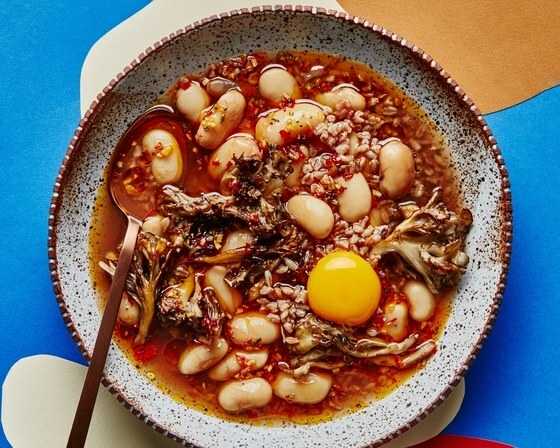 Now, with confidence, flip the rafanata out onto a plate so the cooked side is exposed (the best way to do this is to place a large dinner plate over the pan, then flip the pan, catching the rafanata). Slide the rafanata back into the pan, cooked side up, and cook for another 3-5 minutes. 5. Slide the rafanata out onto a serving plate and slice into wedges. Serve with sour cream, mustard, or solo. I must say, it never occurred to me that people would use their cell phones instead of watches which is, apparently, what most of you do. 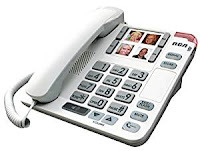 My cell phone is a flip top and would be a pain to carry around all the time although I do have it in my purse when I go out. Hardly anyone knows the number anyway, I mostly have it for emergencies anyway or to take the occasional picture. Well Matt's fracture surgeon said he could take the boot off and do what he liked, i.e. bowling, shopping, etc. etc. I am not sure how closely Matt is going to follow this mind you! He has agreed to go bowling tomorrow to try it out. We will see what happens. He keeps saying his injured foot is his take off foot for bowling. He will not consider doing it any other way even if temporarily. One of the best women bowlers always goes up to the foul line and throws her ball. NEXT DAY: at 4 a.m. I started thinking about Matt's visit to the Fracture Clinic - I realised that the surgeon had only been looking at Matt's toe which was a secondary, and less serious, injury but had not mentioned his ankle bone once. Also, the X ray which had been on view in the clinic was not the one I saw in Emergency which showed his ankle injury. From this I conclude that the Doctor knows nothing about that particular injury and has never been informed of it. If Matt starts running around on it and doing what he likes, he may exacerbate the ankle fracture. I had my CT scan and it didn't take long thank goodness because lying on my back with my arms flat out behind me was damned uncomfortable to say the least. I have an appointment with my family doc. in a week or so to find out the results. Also, I booked Matt's free lunch at Mandarin on Jan 30th. We get a week either side of the actual date. 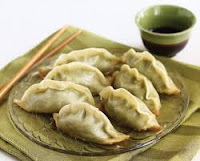 It is dumpling festival too, whoopee. I have had this recipe for a long time but never tried it. Sounds good. 1. Before I get to the nitty-gritty of the ingredients, I must explain the setting. Wishing for luck, abundance and prosperity is always a feature of CNY activities. The invocation of these comes with the tossing of this raw fish salad. The higher you toss, the better your luck and prosperity for the coming year. If you have a large round dining-table, it's easier. You need a large round, flat serving-dish and chopsticks for everybody. 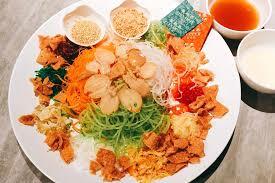 When the dish is brought to the table, always at the beginning of the meal, everybody stands and all together dig to the bottom and toss the salad as high as possible for about a minute, shouting "Lo Hei" (pronounced 'low hay') many times. I mean HIGH - chest-level is usual. Yes, it makes a bit of a mess, so forget the best damask tablecloth (it's quite acceptable to use a clear plastic covering). Then all sit down to enjoy. 2. The amounts I have given here are purely suggestive and can be adapted as wished, as long as the key ingredients of raw fish and colourful vegetables are present (red/orange/gold colours are imperatively auspicious). Mix the lettuce/radish with the carrots and arrange in a mound on the plate. Scatter the pieces of raw fish over the top and down the sides. Sprinkle the ginger, lime leaves, spring onions, coriander, sesame seeds and crackers over it. Drizzle the Plum Sauce over and all toss as high as possible. Serve on individual plates to eat. 3. *Plum Sauce: What I use here is basically a thin, pouring consistency, plum-flavoured salad-dressing made like a vinaigrette but substituting pureed plums for the vinegar and adding the pepper, salt and five-spice powder. It should be sweetish, not tart. My watch stopped over the weekend and I got tired of looking at a blank wrist so before I went bowling, I went to Walmart who deal with Timex. Unfortunately our local Wally World is only a small store so they don't have a jewellery dept. I was about to leave and suddenly decided to look at the few watches they do sell there. I ended up buying a digital watch for $13 tax included with a 2 year warranty. I would likely have paid nearly that for a battery. Bowling alley owner helped me cut the thing out of it's box and then set it for me. Wasn't til later that I realised it was running on 24 hours. Haven't checked on how to change it yet. My bowling was pretty useless today, just about maintained my average. At least I wasn't the only one on the team this week. Don't yet know if I maintained my high average though. I was being chased by two other ladies. Gotta get up early to get himself ready to go ro the fracture clinic as well as have a CT scan on my back too. Pasta, pasta, pasta - I am not that familiar with ditalini, but... I must try this, sounds good. 2. While pasta is cooking, combine remaining ingredients in a mixing bowl. 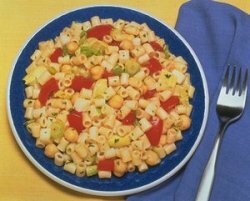 When pasta is done, drain and add it to chick pea mixture and toss to mix. 3. Let stand 3 to 5 minutes and serve. Not a very exciting weekend unless you call the shut down of the American government exciting, I guess it is for Americans, although exciting may not be the right word. As for us the weather hasn't done much although it was thick fog Sunday morning. I commented to Matt that I thought calling England a foggy country was unjust. We get quite a lot of fogs here. He disagreed. I spent a fair amount of Saturday cooking. Made Spiced Beef in Red Wine which is one of my favourites I also made some marinara sauce, always a good sauce to have on hand. In fact I used some for supper, tossed a few noodles in it to go with our lamb chops and Brussels sprouts. Our water went out on Saturday morning, the super said it was city wide. It came back later and then this morning, on my way to the garbage chute a woman was standing there somewhat forlorn - apparently the washer had just stopped on her and she didn't know what to do. I had a look for her and there was water in the tub but nothing happening, the window read something I didn't understand and nor did she. She went to phone a friend in the building who turned out to be a good friend of mine. We were all discussing it and trying to phone the owners of the machines when the super walked in and told us there was a water leak which was being repaired so no water was getting into the machines. Poor woman, only just moved in and first time using the machines. At least I can bowling tomorrow and then, on Tuesday morning Matt goes to the fracture clinic and at the same time, more or less, I am having a CT scan on my back. It is now a month since he fell down the steps and broke his foot bone - his lateral malleolus if you are interested - and I am hoping the doc will say he can now just use a cane. Fingers crossed. from The Bazaar in Miami Beach, FL. 1. Preheat oven to 275°. Heat 2 Tbsp. oil in a large skillet over medium-low. Add onion, bay leaf, and a pinch of salt and cook, stirring often and reducing heat if onion is browning too fast, until onion is golden brown, 25–30 minutes. 2. Add olives, capers, raisins, and 2 Tbsp. water to skillet and cook, stirring occasionally, until olives are softened, about 4 minutes. Add rum and cook until liquid is evaporated, about 5 minutes. Remove skillet from heat and stir in lime juice and 1 Tbsp. water. If needed, add a splash or two more of water so mixture is saucy; season with salt. 3. Season salmon with salt and pepper. Cut four large sheets of parchment paper. Working with 1 sheet, spoon one-quarter of sauce onto the center of paper; scatter 1 Tbsp. cilantro over. Create a well in the sauce the size of a salmon fillet and place fish in well; drizzle with oil. Gather edges of parchment up and over salmon and tie tightly closed with kitchen twine. Set on a rimmed baking sheet. 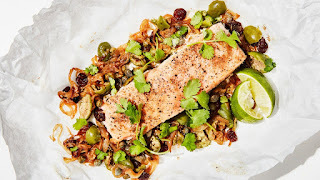 Repeat with remaining parchment paper, sauce, salmon, and 3 Tbsp. cilantro. 4. Bake packets until salmon is cooked through, 20–22 minutes for medium (go 2 minutes longer for well-done). Remove from oven and let salmon steam in packets 2 minutes. Unwrap and top with more cilantro. Serve with lime wedges for squeezing over. 5. Do Ahead: Sauce can be made 2 days ahead. Let cool; cover and chill. Before using, add water to loosen if it looks tight. OK I'm being real lazy, I have an excuse. This looked delicious to me. It talks about all kinds of fancy ways to make the coffee but you just need to make a very strong coffee whichever way you normally make coffee. Think I might nip out and get some minty ice cream. the dessert world’s greatest flavour hits. 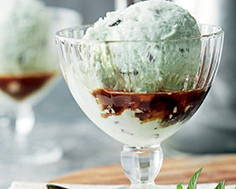 This affogato variation uses festive green mint-chip ice cream or gelato as its base, topped with a coffee-and-chocolate elixir. If you’re serving it at the end of a late evening, consider using decaffeinated coffee or espresso. Use an espresso machine to make a 1-oz (30‑mL) shot for each serving of affogato. Alternatively, set your pod-machine coffee maker on the strongest, shortest brew setting, or make a strong French-press coffee using 4 tbsp (60 mL) of fine-ground espresso beans to every cup (250 mL) of hot water, steeping for 1 minute before plunging. Add ½ oz (15 mL) chocolate liqueur to each oz (30 mL) of espresso or coffee. At the table, pour approximately 1½ oz (45 mL) of hot liquid around scoops of mint-chip ice cream or gelato in individual serving dishes. Noodles, No Bowling, Marijuana, Walking. Now and again I have a Noodle Bowl for lunch and this week I tried a new type for which I had to provide my own bowl. 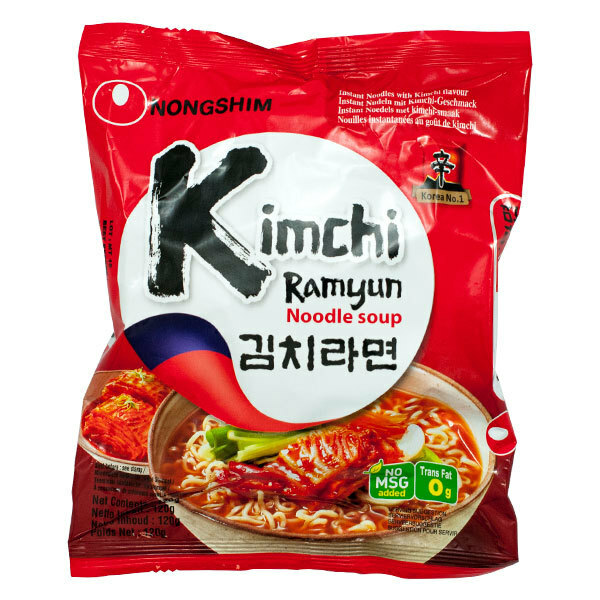 Nong Shim Kimchi. They were delicious and I will certainly be buying them again. Not sure how healthy they are, but for an occasional treat..... I'm not sure this is quite the right package but having thrown mine away I have nothing to compare with. 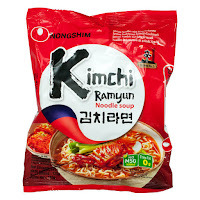 However, I have had Nong Shim noodles before so I knew they would be good. I often wonder if there is some Asian in me somewhere because I am so fond of these noodles. I would like to do one of those ancestry tests. Too expensive at the moment, but I do know one thing I was told by the hospital years ago, I have a double length colon which is unusual for Westerners and quite usual for Indians and other Asians from that part of the world. Makes me wonder. I was deprived of bowling today, boo hoo. I seem to have a bit of a bad knee plus I had very little sleep last night as, for some reason, I kept getting leg cramps and having to get up and drink some tonic, the quinine usually helps although it wasn't doing a lot for me last night. I got so sick of tonic water I almost wanted to throw up. So for something easy we are having what I call Leftover Chicken and Ham although it originally started with Turkey and was a recipe by Paul Hollywood of Great British Bakeshow fame. As I have said, I buy a rotisserie chicken and make this dish, without the pastry that Paul did. It really is delicious and freezes really well. I think I will have to be making more soon. I heard from the Cannabis lab who said I could fax them the doctor's referral so I did. My friend said it took 2 weeks to even hear from her lab so I guess I am lucky. You then, apparently, have to complete a very extensive questionnaire which they use to take into consideration as to whether you should be allowed the Marijuana. Matt just did 6 laps along the corridor outside our apartment so things are looking up. He still will not do the exercises without prompting. I call it prompting, he probably thinks of it as nagging LOL. Although I am not working any more, I am always looking for different breakfasts and for those of you who do eat breakfast I am sure these will appeal. I like the idea of doing them beforehand as I often find myself thinking about what to cook myself in the mornings. You’re running out the door, slightly late for work, with a thermos dripping with coffee and a half-unwrapped granola bar in your mouth. If this sounds like just another day in the life, you need these make-ahead egg sandwiches in your life. Take less than an hour one night or weekend to make a batch (or 5) and be prepared with a real breakfast for days. like. If you have some on hand, toss in chopped parsley or chives. 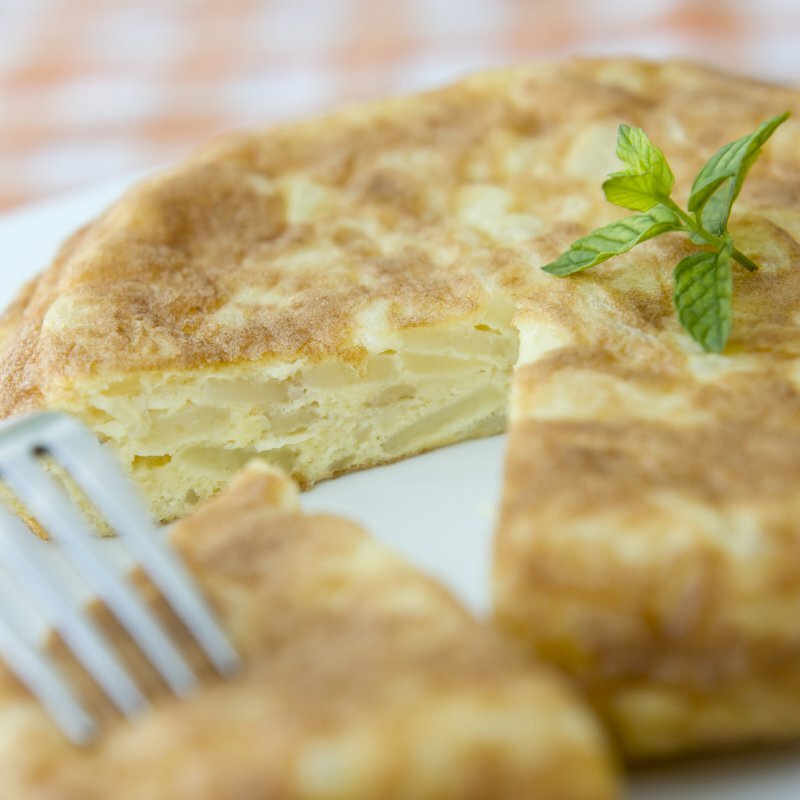 Pour the eggs into a well-greased baking dish or muffin tin and bake them until just firm. Meanwhile, cook a mess of bacon, sausage or ham and set the meat aside. 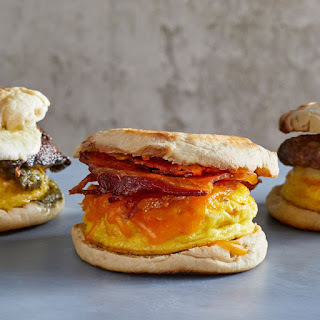 When the eggs are cooked, lay them onto a toast a bunch of English muffin with slice of cheese and a couple pieces of the cooked meat. Stack the sandwiches a container, then tuck them into the freezer. When you’re ready to eat, pull out a sandwich, wrap it in a damp paper towel, then tightly in parchment paper, and pop it in the microwave. 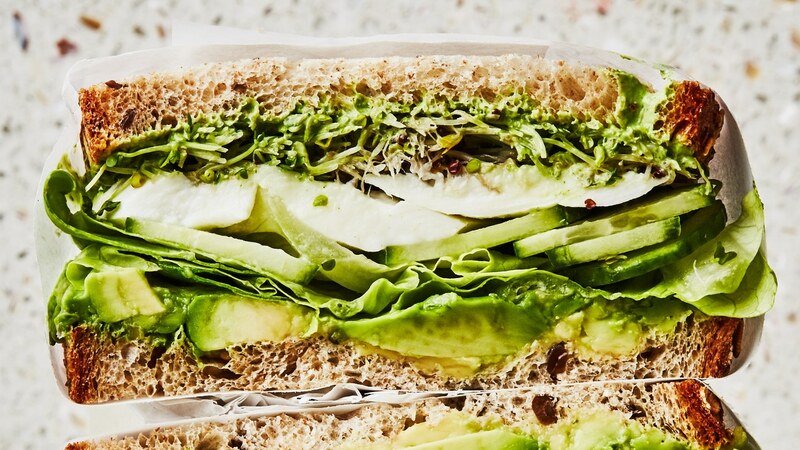 In just about 2 minutes you’ll be out the door, sandwich in hand. In the comments yesterday, I mentioned that my mother bought a pressure cooker in 1946. In fact she bought it at the Britain Can Make It exhibition which took place in London. Bearing in mind that I was 8 years old, that visit has hung around in my memory pretty well. I remember things like a robot which answered questions (probably a human speaking through it) which I totally believed in at the time, and a shot tower which was for making free fall shot balls (the war was just over remember). The link above will take you to all kinds of interesting pictures. The idea was to show the world we could still make things even after the pounding we took during World War II. 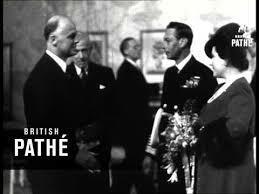 The picture is of King George VII and his wife Queen Elizabeth (Queen Mother) opening the exhibition. Went to exercise class this afternoon (Wednesday) then went to see my doctor about obtaining medical Cannabis. I now have a referral to a clinic in Cambridge, the next town. Not sure why as there is a clinic in Kitchener. Seems a tad odd. Who would have ever thought I would end up taking Marijuana. I understand they do something to the medical version to stop you visiting la la land. Matt isn't convinced it's a good idea, but if they can relieve my pain, well and good. This page lists a heap of conditions which are being treated by medical Cannabis. I didn't realise it was good for so many things. I am glad I left home early, I had the devil of a job parking within my walking range of the doctor's office. Trying to think of something for supper and deciding I wanted some spaghetti but I had broccoli to use up, I found this recipe. In the end didn't have a lot of time so we just had spaghetti and fried eggs which is one of our favourites. 1. 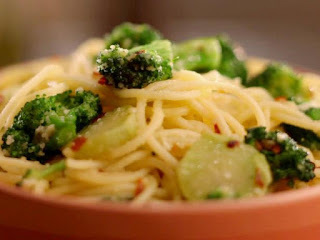 Add the broccoli florets to a large pot of boiling, salted water and cook until al dente, 3 to 4 minutes. Prepare a bowl of ice water. Remove the florets from the pot, reserving the cooking water. Stop the cooking process by shocking them in the ice water. Remove the florets and pat dry. 2. Add the spaghetti in the same pot of water. Cook until al dente, about 8 minutes. 3. Meanwhile, add the oil, sliced broccoli stems, red pepper flakes and garlic to a large skillet over medium-low heat and sprinkle with salt. Cook until the garlic is lightly toasted and fragrant, about 8 minutes. Add the florets, toss to coat and warm through. 4. Drain the pasta in a colander set in the sink, and add the pasta to the skillet. Increase the heat to medium-high. Toss the ingredients and adjust the seasoning if needed. Transfer the pasta to a large serving bowl. Squeeze the lemon juice over the top and sprinkle with the Parmigiano-Reggiano. Serve. More on Boats, Bits and Pieces. Having hunted high and low, I finally came across this picture which was sent to me a year or two back. 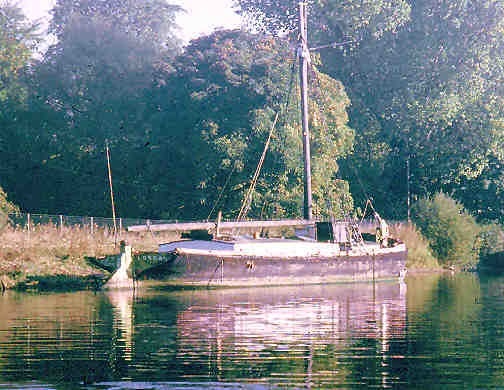 It is our Thames Barge Iota now just disintegrating at Windsor apparently. I must say, she doesn't look much like the Iota I remember at all. We had a wheelhouse at the stern for a start. It is impossible to read the name on the transom (back end) but I was definitely told it was her. Looking at this picture again, I am beginning to wonder. Whichever barge this is though, it is sad to see it so neglected. Anyway, after Sunfish my father decided to buy a boat which was actually built as a yacht and he found one in, I think, South Africa. She was brought back to England and my parents moved on board with my three young cousins who were being cared for by my parents. We had lots of fun times on Pamara although by then I was living away from my family. My dad retired and took Pamara out to Malta where they lived for a few years taking trips here and yon. For some of their voyages I joined them some I was unable to. I was with them in 1969 when they went to Yugoslavia (as it was then called) and the day I left was the day they walked on the moon. John, first husband, and I caught a cab to the airport and the driver had the radio tuned into the landing. He figured we had a TV on board, we didn't. The broadcast was in English but with commentary in the local language so we had trouble figuring out what was going on. We saw it all when we got back to the UK. My father really never got to see any of it which was a shame as he would have been very interested. They left Malta and cruised the Med stopping at various ports in Italy and France. I joined them in Southern France. Finally ending up in Alicante, Spain where they eventually sold Pamara and bought a delightful house to live in outside the town. I loved that part of Spain. One thing I neglected to tell you about Silver Sunfish, she was used for mine sweeping during the war. Obviously she survived. Tuesday our Foot Nurse came and was a bit took aback I think to see Matt with his air cast boot. However, he took it off and she treated his feet and mine of course. Matt finally got his Health Card in the mail too. 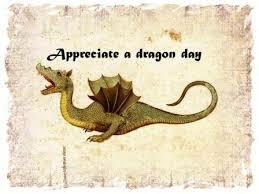 Oh, and did you you Tuesday January 16 was Dragon Day? I am very fond of soups and broths with beans in them so here is one that appealed to me from Bon Appétit today. Great food for dragons. 1. 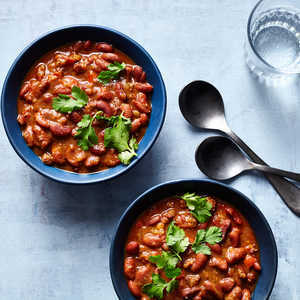 Bring onion, carrot, smashed garlic, beans, and 14 cups water to a boil in a medium pot, reduce heat, and simmer, stirring occasionally, until beans are creamy but still intact, 70–90 minutes (time will vary depending on size and age of beans). Using a slotted spoon, transfer beans to a medium bowl; discard onion, carrot, and garlic. 3. Cook chopped garlic, chiles, and ? cup oil in a medium skillet over medium heat, stirring often, until garlic is golden, about 4 minutes. Remove from heat and mix in rosemary. Transfer chile-garlic oil to a small bowl; season with salt. 4. Wipe out skillet and heat remaining 3 Tbsp. oil over medium-high. Cook mushrooms, undisturbed, until browned underneath, about 2 minutes. Toss and continue to cook, tossing every so often, until mushrooms are browned and crisp in most spots, another 6–8 minutes. 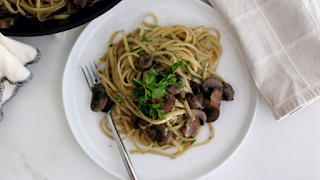 Splash vinegar over mushrooms, season with salt and pepper, and give skillet a few shakes to combine. 5. Ladle stew into bowls and top each with some crisped mushrooms and an egg yolk (if using); drizzle with chile-garlic oil. 6. Break egg yolk and stir into soup just before eating to give it a more silky consistency. By the way, Matt is getting around a bit more now and helping me more so I am not feeling as frazzled. He sees the fracture clinic doc on the 23rd and I wouldn't be surprised if he says Matt can dispense with the air cast - generally referred to as the boot - sometimes not that politely. His physiotherapist has been 3 times and is not coming again until after we have been to the clinic. She has given him a bunch of exercises and told him to walk around the apartment and along the corridor. He is pretty good about walking, not so good at doing the exercises. Over the weekend I did them as well. They are extremely simple but intended to strengthen the leg muscles. I was asked how long I had lived on the Thames Barge I wrote about yesterday, but I couldn't honestly remember. I know my dad sold it and bought the MFV shown in the picture. The Silver Sunfish. This vessel was a lot hardier than the Thames Barge and could be taken anywhere. Mind you as I have said in the past, they row across the Atlantic. She was a little shorter than the barge which was about 85 ft. long and I think Sunfish was closer to 80 ft. It's a long time ago now so don't hold me to it. With Sunfish we went further north to Denmark and Norway. Travelling through the Keil Canal where we were met by my German penfriend of the time. Don't think she liked me as I never heard from her again. I always remember her saying how terrified she was hearing Hitler's voice on the radio. WWII was very close at that time. I remember we had a young man crewing for us (on another trip) who spoke German. We dropped into German ports amongst others and he was almost in tears because a young German was telling him about the brutality of the Russians to the German POWs. My father's remarks indicated that it was probably in retaliation for the way the Germans had treated the Russians during the war. With the Sunfish, Ostend, Belgium became a regular port of call, my parents belonged to the yacht club there and I had all kinds of friends there. We would go dancing and partying particularly at the Kursaal which was more or less what we would call a casino. Because my name is Josephine, I was known as the La Petite Impératrice (Little Empress). At least a couple of my parent's Belgian friends were at my first wedding. We also got gifts from other countries from people we had met during international race meetings in Ostend. Now, many years later I wonder what happened to some of these people. 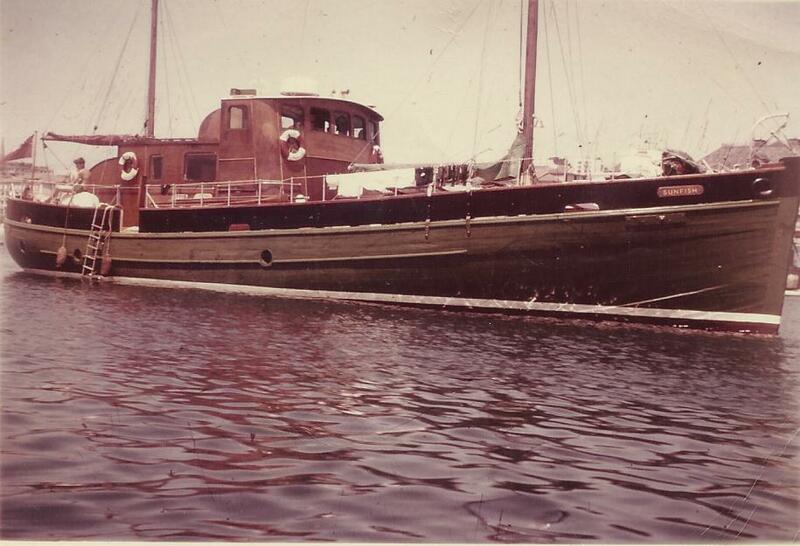 Before my father sold this boat for another, I had gone to live in London in a two room flat with shared bathroom. Bit of a change. I have no doubt that many of you have an Instant Pot or even a pressure cooker. I have neither but this could be made in a regular pan although it would, of course, take somewhat longer. achiote paste in the international aisle of some grocery stores or at Hispanic grocery stores. 1. Program a 6-quart programmable electric pressure cooker to Sauté on Normal heat. Add oil to cooker, and heat until warm. Add chorizo; cook, stirring occasionally to crumble, until browned, about 4 minutes. Add onion, bell pepper, and garlic; cook, stirring occasionally, until tender, about 4 minutes. Add tomatoes, achiote paste, cumin, and salt; cook, stirring occasionally, until tomatoes break down, about 5 minutes. Stir in stock and beans. 2. Close and lock lid of cooker; turn pressure release valve to sealing position. Program cooker to cook on Manual on High Pressure for 45 minutes. Turn pressure valve to the venting position to quickly release pressure (steam) from cooker until float valve drops. Carefully remove lid. Divide beans between 8 small bowls; garnish with cilantro. Something I saw or read made me think of my early days. After the war, that's World War II, my father who was always boat mad, discovered a place on the river Medway that was converting Thames Barges into livable accommodation but retaining the basic sailing abilities of the vessels. My father was immediately captivated and ended up buying one and selling the very lovely Georgian house we lived in. Thames Barges were originally designed to carry all kinds of goods such as bricks or straw, up and down the rivers of England and along the coasts. The black and white picture is that of our barge, Iota. The coloured one shows a barge fully rigged. They had a very shallow draft (i.e. didn't need much water) and could be handled by a man and a boy. They were quite majestic to see sailing the coasts and rivers and it is, to me, so sad to see them rotting on the shores these days. Including the one we lived on. I was sent a photo of her which I can't find. My father decided to take her, Iota, to France, Belgium and Holland even though they were not built to cross the Channel or North Sea. He also had part of the keel removed, it was partly inside the boat and in some barges who's owners had left it, you had to step over it to move about the living areas. Very awkward. My dad was told that Iota would break her back, she certainly didn't, despite the odd predicaments he landed her in. 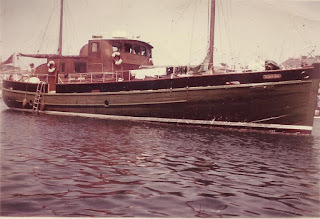 One time he got caught by an ebbing tide and ended up with the bow on one mudbank and the stern on the other with nothing supporting her in the middle. I think my father was a tad nervous but she survived it for close on 6 hours before the tide came back. He also entered Iota in some of the Thames Barge races which took place in those days. Barges were originally black, but some of the barge owner competitors had painted them white and they looked quite fantastic taking part. I see the races are still happening so I guess not all barges are rotting on the beach. For Saturday at dinner I cooked the Apricot Glazed Bacon Wrapped Pork Tenderloin which I prepared on Christmas Day. This time I made a better job of it and it was really good. Christmas time the bacon I had was a bit too thick but I hadn't bought it specially because I hadn't anticipated cooking on Christmas Day!! If you are looking for a special dish for an occasion I can highly recommend it. However, I have decided I cannot make Chocolate Volcanoes. Mine definitely do not work properly. So, screw it, I will buy the ones from my grocery store which are very good. I don't know why they don't work for me, I use the same recipe Matt used and they worked fine for him. Mine are kind of OK but don't turn out of the pots very well. We ended up eating from their pots with a dollop of cream on top. I thought this looks good for a cold winter's night. If you live in Australia you will have to wait a few months I guess. The challenge: The flavors are always too bland. paste and fish sauce, and we finish with fresh touches of cilantro and lime juice that amplify the taste of everything. 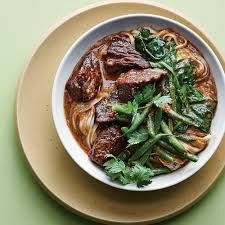 Serve over a bed of brown rice or brown rice noodles to catch all the sauce. 1. Heat a large skillet over medium-high. Add oil; swirl to coat. Add beef, and cook in 2 batches, turning occasionally, until browned on all sides, about 6 minutes. Place browned beef in a 5- to 6-quart slow cooker. Add stock to skillet, stirring and scraping to loosen browned bits from bottom of skillet; transfer mixture to slow cooker. Add curry paste, fish sauce, sugar, and onion; stir to loosely combine. Cover, and cook on low until beef is very tender, about 8 hours. This is a recipe Matt cooked for me for a birthday meal. I think it was followed by lobster. Was a while back; it was a delicious starter. 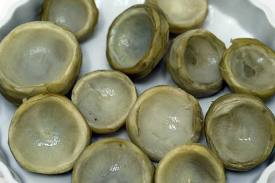 I don't have a picture of the dish but I thought a picture of artichoke bottoms would be appropriate. Of course the recipe also calls for asparagus!! Originally this was separate recipes and the book called for a portion of recipe # something, and another portion of recipe # something else. I sorted it out and put it all together. 1. BECHAMEL SAUCE: Melt butter in a saucepan over medium heat. Cook onion til transparent. Add flour, stir for 1 min. Add milk stirring, season with salt, pepper, nutmeg and bouquet garni. Bring to boil over low heat for 15 mins. stirring occasionally. Strain sauce, stir whilst cooling to keep from skinning. 2. MORNAY SAUCE: Mix Bechamel and cream in heavy saucepan, boil over medium heat, reduce to two thirds. Add cheese stirring til melted and well blended. Remove from heat and beat in butter, bit by bit. 3. DUXELLES: Put mushrooms in a bowl, sprinkle with salt. Stand for 30 mins. Gather in cloth, squeeze out juice. Soften onion in butter/oil over moderate heat for 3 mins. Add mushrooms, cook very slowly til moisture evaporated. Add pepper, parsley, cool and store covered in fridge til needed. 4. ARTICHOKES RICCA: Combine Mornay and Duxelles in shallow oven proof dish. Arrange asparagus in centre, artichokes round edge. Sprinkle with cheese and melted butter. Cook at 500 F for 8 mins or until cheese is light gold. Watching the videos being made by Ivy, The Happy Whisk, I am envious of her air fryer. It seems to do everything and healthily at that. I would love to get one but right now "the dibs are not in tune" to use a very old English expression. If you are not watching her videos, you should do so, they are fun and sometimes quite dotty which we kind of expect from The Happy Whisk. If you aren't watching them you should be. Tonight I am somewhat tired so not going to write much. I did go bowling this aft. One good game, one lousy. Legs hurting. Don't think I have mentioned I am going to see my doc about getting medical Marijuana. Have a couple of friends using it who say it is marvellous plus talking to the Care Co-ordinator the other day she attended a seminar about it and seems to think it is pretty wonderful and much better for me than the codeine (Tylenol 3) that I take at the moment. Will see how it goes. Supposed to have got ice pellets tonight. It definitely rained but not sure what kind of rain we got. Not planning to go anywhere tomorrow so it doesn't matter to me. A quick recipe. My dad used to make this and it is one of my favourites. and then top with sliced tomatoes. Season to taste. Simple but delicious. Just watched an interesting Nature programme on Yosemite and was particularly interested in the Sequoia which seem to be surviving well despite the drought in Yosemite and the warming trend. They theorise there are water sources under the trees themselves. It is such a beautiful place it is sad to know that the lack of snow is affecting the park and will, of course, continue to do so. When you see the rushing rivers and all the lovely falls, it is hard to believe in eventual water shortage but with global warming that is what's happening. Started watching an interesting programme about Black Holes but then Matt decided to go to bed. so I went to assist. I recently renewed my subscription to CARP (Canadian Association for Retired Persons) this year there seem to be lots of benefits to doing so. Also they sent me a Tim Horton's card (coffee and donuts) but I have no idea what it is worth, one coffee, or a coffee and donut or a full lunch?? I will have to go in and ask. I can also go to the Swiss Chalet and get a meal for 2 for $25. 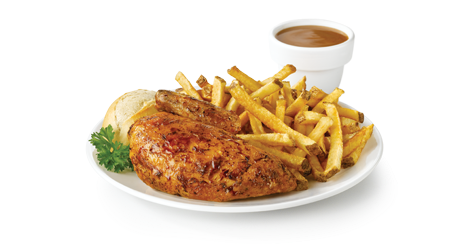 That is a shared started, 1/4 chicken dinner as shown and a beverage each. Not a bad deal. The link is to one which is just up the road from us. There are all kinds of deals on other things too for health, entertainment, etc. etc. etc. I can also save 10% off funeral costs. However, as we paid ours years ago, guess I can't cash in on that. We watch Wheel and Jeopardy on a channel which advertises stairlifts - they can give you $500 off on those too. Not that we would need one. The ads for these things drive us nuts, they go on for ever and ever. Had forms from the Ministry of Transport saying Matt's license had been suspended. I knew that anyway although I don't think he registered the fact. Have to return the license asap so will drop it in tomorrow. I had hidden it anyway. He is supposed to go for an assessment at some time or other, at which time it will be decided if he can continue to drive. The trouble is this accident thing did shake up his brain considerably. He was driving fine before it happened and had passed all his cognition tests at the driver's place earlier this year. No I guess I mean last year. Oh yes, the health card, I suddenly thought the hospital would be sending us bills for various things so I phoned Patient Accounts (spoke to them before mind you) and said maybe they had included it with a bill. It turned out the woman I was talking to had just received the card that morning (it had instructions on it NOT to send it to Patient Accounts!! but to leave it in triage for me to collect) anyway, I asked her to mail it to us anyway. Planning to bowl a couple of games this aft, if I can get away. Fingers crossed. Here's a dish for those of you who like fire in their food. Not only that it is vegetarian. Did you know hibiscus were edible? I certainly didn't. I think the stuffed chiles look delicious. creamier texture and less bitterness; standard walnuts work well, too. We add a touch of sugar to the sauce here to balance the slight bitterness of the nuts. 1. To make sauce, place walnuts in a bowl; cover with boiling water. Let walnuts soak 15 minutes. Drain, and rub walnuts with a clean dish towel to remove as much walnut skin as possible. Discard skins. 2. Place walnuts, cheese, vinegar, sherry, sugar, salt, and 1/3 cup milk in a blender; process until smooth. (Sauce will be very thick, more scoopable than pourable.) Stir in remaining milk, 1 tablespoon at a time, to thin sauce, if desired. 3. To make chiles, preheat broiler to high with oven rack 6 inches from heat. Place chiles on a baking sheet; coat chiles with cooking spray. Broil for 10 minutes or until blistered on all sides, but not completely charred, turning after 5 minutes. Place blistered chiles in a bowl; cover tightly with plastic wrap. Reduce oven to 400°F. 4. Bring a small saucepan of water to a boil over high. Add hibiscus flowers; remove from heat. Let stand 30 minutes. Drain flowers well; coarsely chop. 5. Heat oil in a large skillet over high. Add onion; sauté 2 minutes or until lightly browned. Reduce heat to medium-high. Add oregano and garlic; sauté 5 minutes. Increase heat to high; stir in tomato, jicama, carrot, chipotle, salt, and cinnamon. Bring to a simmer, and cook, stirring occasionally, until liquid is absorbed, about 2 minutes. 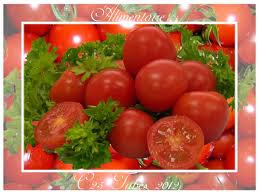 Place tomato mixture in a large bowl; cool 10 minutes. Stir in chopped hibiscus and rice. Cool to room temperature. 6. Remove chiles from bowl. Peel; discard skins. Using scissors, cut a slit lengthwise in each chile. (Do not cut through the opposite side of the chile.) Remove and discard seeds. 7. Stuff each chile with about 1 cup rice mixture. 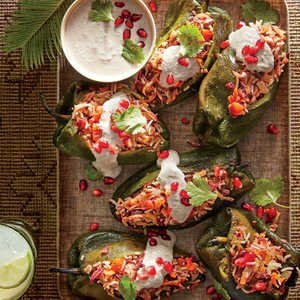 Place stuffed chiles, cut sides up, on an aluminum foil–lined baking sheet coated with cooking spray. Bake at 400°F for 15 minutes or until filling is heated through. Place 1 stuffed poblano on each of 8 plates. Top each with about 2 tablespoons walnut sauce. Sprinkle evenly with cilantro and pomegranate arils. We were all ready and waiting for the Physiotherapist who was half an hour late. Just as well I cancelled my lunch date today She gave Matt more exercises to do, simple ones, and doesn't plan to return until after he has been to the fracture clinic on the 23rd. Meanwhile I decided to call the hospital about Matt's missing health card. I am so glad I did, everyone denies any knowledge of it. I spoke to Emergency, Triage, Patient Accounts and then, I think, Patient assistance or something. She has been trying to trace the card but to date with no luck. So now I have to go to the Social Services office and get a temp one. Grrrr. After lunch I went grocery shopping and spent way more than expected!! I thought we only wanted a few things. I think we will have to give up eating at this rate. By the time I got back I was exhausted. This is a cake I got from an English TV Cook, Fannie Cradock whom I used to watch regularly when we live in the UK. She was famous for always wearing the most extravagant clothes and never wearing an apron when she cooked. I made it a few times and always decorated it with home made marzipan roses. They are actually very easy to make. I must admit I haven't made this cake in years but it was very rich and made a wonderful dessert. I went back in my blogs to find a recipe from a long time ago. Sunday night and Monday morning we had lots of snow. I half expected the Regional Care co-Ordinator to call and cancel but she didn't. She came and asked lots of questions. She is trying to arrange for Matt to go to a day group where she says they do all kinds of things to help stimulate the memory. When it comes down to it, he will probably refuse to go. CCAC are now called Local Health Care Integration Network!! LHINS I guess. They arrange a lot of assistance if required. Like help with showering or dressing etc. One thing she told us, I commented on the cost of Retirement living and she said one could get assistance. When she finally left, I grabbed some food for our lunch and then went bowling. The roads weren't as bad as I expected. However, the bowling alley had not been ploughed. I bet they were a tad annoyed about that. Turned out that I was the only one in our team that showed up. The team we were playing against only had two people so I ended up bowling with them. From my calculations I think we beat them hands down and I managed to maintain my average. Not bad considering my second game was lousy. Matt had a bowl ahead and for my bad game he had a good one so that balanced us out team wise. I was surprised how few people seemed to notice that Matt wasn't there. This morning, Tuesday, his physiotherapist comes to see him. I gather she is supposed to do 6 visits. Then I have a lunch date with a friend. She and hubby are heading to Florida at the weekend. Matt won't join us, he could, but he seems to not want to be seen with the aircast. Then if I am feeling up to it, grocery shopping. I don't find the shopping a problem, it's lugging the cart up to the apartment. We park in the farthest part of the garage so I find the walk quite a hassle. Then of course, putting all the stuff away. At the time of writing this recipe I have just eaten breakfast but this picture makes me feel hungry. I hadn't heard of making this with crepes. If you have ever tried stuffing the pasta, you will know why this is so much easier plus it apparently freezes well. me.” And here's why he calls this manicotti the greatest recipe of all time! 2. Using an electric mixer on high speed, beat eggs in a large bowl until light, airy, pale in color, and can nearly hold peaks, 6–8 minutes. 3. Reduce mixer speed to low. Gradually add flour and salt, beating well between additions, until no clumps of flour remain. With mixer speed on low, slowly pour in 1½ cups water and continue to beat until well incorporated. Cover and let dough rest at least 2 hours (this gives the flour time to hydrate and results in a smoother finished texture). 4. Heat a small nonstick skillet over medium and spray with nonstick spray. Pour 2 Tbsp. batter into skillet and cook, swirling skillet constantly to encourage crepe to form a nice, round shape, until set, 15–20 seconds. Tap out crepe onto a clean towel; gently flatten any creases. Repeat with remaining batter; if possible, do not to stack crepes. 5. Do Ahead: Dough can be made 1 day ahead; keep covered and chill. 7. Preheat oven to 350°. Mix egg yolks, ricotta, mozzarella, and Parmesan in a large bowl; season with salt and pepper. Squeeze out excess liquid from spinach, if using, and add to egg mixture; toss to coat. 8. Spread 1 cup sauce in a 13x9" baking pan. Working one at a time, spoon 2 Tbsp. filling in center of crepe. Spread filling all the way to the ends. Roll up crepe, then flatten slightly with your hands. Transfer seam side down to prepared dish. Working in batches if needed, repeat with remaining crepes and filling, leaving a small gap in between each. Top with sauce and cover with foil. Bake manicotti until cheese is melted and sauce is bubbling, 35–45 minutes. Let manicotti cool slightly in pan to set, about 15 minutes. Top with Parmesan and pepper before serving. 9. Do Ahead: Filling can be made 1 day ahead; cover and chill. 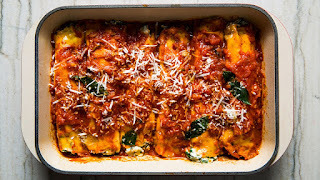 Manicotti can be made 1 month ahead; transfer to airtight containers or freezer bags and freeze. Unbeleivable, Cold. Polar Bear, Elephants.